The first chess boom in Iran occurred when Seyed Javad Alavi won the 1997 World Cadet Chess Championship under-10 in Cannes, France — the first world title in the history of chess in Iran. Ever since then, new players have been entering the scene constantly. Ehsan Ghaem Maghami achieved the first GM title in 2000 and to date Iran has produced 15 grandmasters, most of whom are playing actively. In recent years, we are witnessing a second chess boom in the country. Not only have the numbers of GMs been increased, but also the new generation of players are demonstrating higher chess skills. Both open and women’s national teams, consisting of the young talented players, have achieved admirable results in the last two Chess Olympiads [e.g. 17th and 14th in Batumi 2018 -Ed.]. From the start of 2018, the new golden generation of chess players has begun to blossom. The country currently has three players among the top 20 Juniors, equal with the USA. In January, 18-year-old Parham Maghsoodloo produced a spectacular display by lifting the IIFLIM Mumbai International title and receiving the trophy from the Indian legend Viswanathan Anand. Later he took first place at the 8th A. Margaryan Memorial. His brilliant victory at Sharjah Masters with 8 out of 9 was arguably the most historic moment ever in the history of Iranian chess community. Here's a look at Maghsoodloo’s win against Gawain Jones. He dared to play Sicilian Defence against the man who has written the book, "How to beat the Sicilian Defence’’. But his performance in the World Junior Championship was even more unbelievable: He became champion with one round to spare finishing on 9½ out of 10. He also won three other tournaments decisively in Iran during the year. After the Batumi Olympiad, Pouya Idani, the second board player for the national team, clinched the Goa GM International title. He continued his fine run in the Chigorin Memorial in presence of many strong players and finished clear first. He is the student of Pharmacology at Shahid Beheshti University, one of the best medical sciences universities in Iran. In November, 18-years-old Mobina Alinasab made history by defeating two far higher rated players (Elisabeth Paehtz and Monika Socko) in the Women’s World Championship. It was the first time that an Iranian reached the upper rounds in the World Cup. In the third round, Alinasab missed an easy win at the very last moment of the first game against Mariya Muzychuk. She lost the next game and the overall match but her performance in the knockout tournament was really excellent. In the Asian Individual Championship, 17-years-old Mohammad Amin Tabatabaei was a sterling representative for Iran and grabbed the silver medal both in the classic and the blitz sections. 15-years-old Alireza Firouzja, who is really active in online tournaments as well, became the gold medal winner of the Asian Blitz Championship. 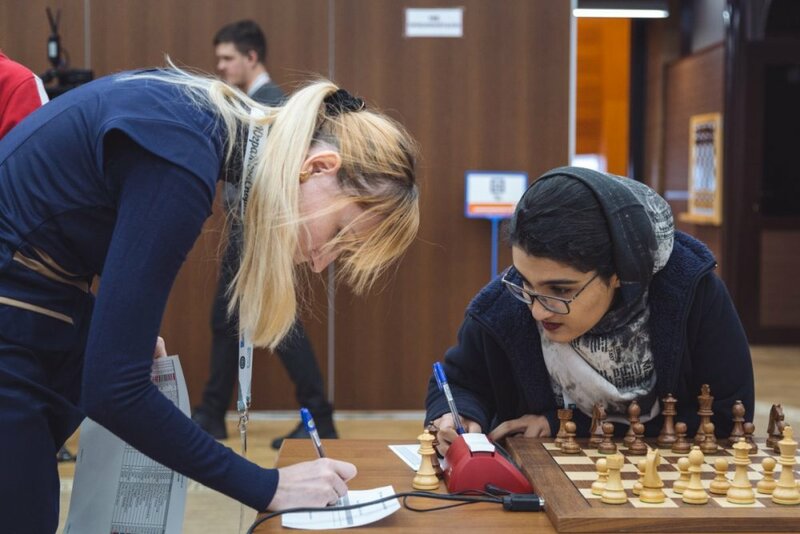 On the last days of the year, the World Rapid and Blitz Championship held in Saint Petersburg, Russia, Sarasadat Khademalsharieh, who missed the last year’s competition in Saudi Arabia because of visa problems, played magically and bagged two silver medals in both the rapid and the blitz sections and the gold medal for the combined results. It was the first time in history that an Iranian achieved an adult world chess title. She followed it up in January with a fine performance at the Gibraltar Masters. Alireza Firouzja was on fire in the World Rapid and Blitz Championship and came the 6th in the rapid section. His start in the blitz section was really nice as well (6½/7), but his defeat against Magnus Carlsen destroyed his concentration and prevented him from repeating another amazing performance. All these results have been achieved just during the last 12 months and a bright future is waiting for this newly emerged generation of chess prodigies. Shahrokh Mojtabaei Shahrokh is an authorized dentist in Denmark, graduated from Tehran Medical Sciences University. As a chess enthusiast, he enjoys chess by playing, training, writing articles and reporting chess news. He plays chess in tournaments and has been a team member of K41 Club at the first division of Danish League. He has written a bunch of articles in the only Iranian chess magazine, ‘’Mahname Shatranj’’. He also reports chess news and articles for Unity Chess Club in Arizona, USA. Ivan Sokolov is the head coach for the Irania Team in the Olympiad Batumi. Firouzja has chances of being a top player in a near future but Iran government must pay special attention to him. He and Maghsoodloo don't have a personal coach and most of the time top iranian players are working with each other without any coach.